I'm back sitting at my desk. Is it really a year since the last post? How time does get away. In my defence, I have been active with photos and posts on our Facebook page and Instagram, both of which I find convenient and spontaneous and probably a better representation of events. Much has happened here, both in the vines, the winery and in our lives in general so here is a (hopefully) brief update. 2017 was a busy year and very warm for the vines. Things grew like topsy and ripening happened in a rush so that harvest was early and very short. The wines are bigger and heavier than we have made in the past. Our first grandchild, Teddy, arrived in the middle of vintage leading Jonathan to write on the white board, recording all the picking details: 'Cabernet/Pinot/Shiraz/Chardonnay/Babies 1'.!! The winemaker, fresh from pressing, meets his first grandchild. In May I flexed off to Norway to go wwoofing in a commercial nursery in Kristiansand in the southwest. It was quite a change from viticulture and very interesting and ultimately useful, as well as being lots of fun. All grist to the mill. 2018 was difficult due to disease pressure at critical times, particularly before bunch closure. We have continued with our biodynamic regimen which helps the vines' resilience so that they recover quickly from these adverse events. In the end we were 30% down on our normal harvest: better than some who did far worse. There are other options that we can explore with biodynamics, using other biological sprays such as whey etc, which I would like to look at in this coming season. Each season is different, keeping us on our toes. We never really know what is coming. Just after this vintage young Clementine arrived into our world, a beautiful baby daughter to Lizzie and Matt and our second grandchild. So far this year we have had lower than average rainfall: virtually none in March and May, as well as a dryish winter; rain periods but no mud, not a 'normal' state of affairs for this region at this time of the year, but then, what is normal these days? We moved the naughty sheep out of the vineyard yesterday ahead of imminent budburst. We bought 10 more sheep (we now have 20) late last year and they have kept us on our toes as far as managing their grazing. They show no respect for my tentative electric tape that is supposed to shield my new plantings from their busy chewing so we have been at war. I woke up the other morning with the idea that putting the 5 most difficult ones in the freezer would solve our problems; they have been perfectly behaved since. They have, I have to admit, done a fabulous job mowing the vineyard. As things really start to grow with the warmer weather, we will be back on the tractors. Last year we left large tracts between vine parcels unmown, the long grass acting as habitat for insects and small birds. The orchard that we planted in the middle of the vineyard similarly adds biodiversity as well as still producing incredible apples. We have had wonderful help from backpackers, HelpX and family over the last couple of years, both during the year and particularly at vintage. Ed and his friends have come up as a change from their desk jobs and enjoyed the country air, vigorous exercise and lunch or dinner. Our international helpers from Italy, Estonia, Germany and, most recently, China, have been great fun and very interesting. Such a wonderful cultural exchange. We look forward to seeing Edoardo and Eva again in Italy and even going to China at some stage to see how the wine industry is going there. Bella and Neal making authentic Chinese dumplings for us! I continue planting trees and shelter belts here with the intention of reforesting as much as is practical. It unfortunately requires a lots of extra fencing when the plants are small so that the horses, sheep and rabbits don't do irreparable damage. It is slow work but each year sees some progress. Jonathan has been busy putting the wines out to various wine shows and further developing our product distribution. Kat has been our right hand helper with our promotions and marketing, somehow finding time in between looking after a busy 18 month old and running her (and partner's) new business venture. Teddy and me feeding horses. Lizzie, Matt and baby Clem are now in Healesville and Clare is working at the wonderful K&B in the town as well as helping us at home. And last, but certainly not least, we have bought some land down on the Tasman peninsula, a bush block that is part of the land conservancy scheme in Tasmania. We will build a small house but otherwise cannot do other than have some r&r and enjoy the reclusive time that it offers. I'm sure that friends and family with want to join us occasionally! So, here we go, into the 2019 season. BD sprays on next week, some microbiological soil testing to be done, and thus the work begins! Open days this year are 13th and 20th October 2018 at the winery from 10am. andrea and jonathan September, 2018. Twelve months has gone by and here we are again, facing another vintage. The weather has been kind this season with a wet spring getting the vines and garden off to a great start. The dams are nearly full having got to their lowest point ever last year. Rain throughout this season has meant that we have had minimal watering and, despite an early smattering of downy, the vineyard had stayed clean. The last year has been busy with family, travel, general plantings around the farm and plenty of work in the vineyard. We have been blessed with some additional help; initially in late winter when Edoardo Luvici spent 6 weeks with us, helping in the vineyard, encouraging my Italian cooking and assisting our Italian language in preparation for our trip to Italy in september. (hence the photos I have added for a bit of international flavour!) It was a wonderful cultural exchange and we had many long lunches discussing all sorts of aspects of both our countries. By the time we reached Chianti, Edoardo and Eva had moved there as well and we had a joyful reunion in one of the prized restaurants of the region. A couple of weeks ago Marianne came to help, bringing tales of her native Estonia as well as many stories of her experiences working here in Broome, on a cattle station, and then in a supermarket on the east coast. She is new to the world of vines and wine but is learning quickly and enjoying the challenge. 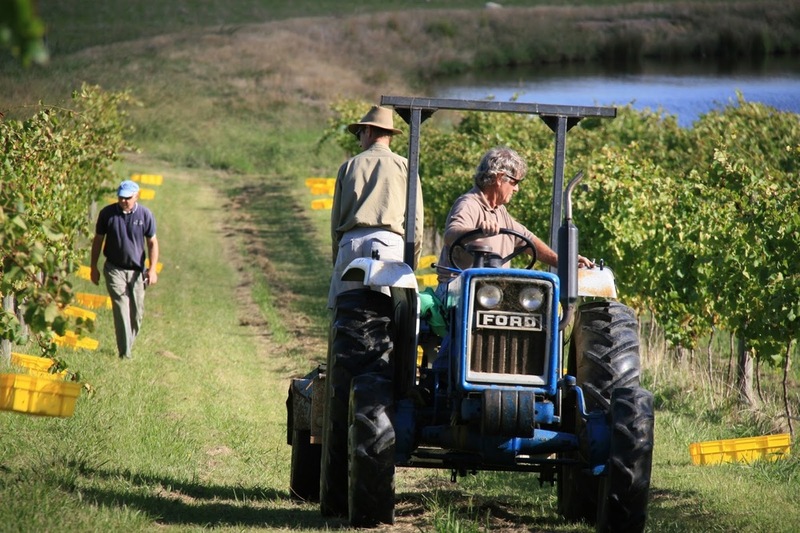 We have continued to follow the principals of organic and biodynamic farming. This year will be our 6th year of BD sprays and we are pleased to see that the farm in general, and the vines in particular, are growing well and remaining healthy. This year we netted all the apple trees and have been rewarded with a large crop of perfect fruit. I am amazed at how dense the apples are; very weighty in the hand and full of flavour and juice. Luckily we have plenty of family and friends who love apples. I'm going to dry them and even try bottling. I have started a new vegetable garden just to the east of the house, in the old pony paddock. It was full of dock after being used for years as a starvation paddock for fat ponies. The dock has done a great job of loosening up the soil, its great tap root doing easily what I would need a machine to do. And the vegetables have done very well. One must only plant one, or at the most two, zucchini plants! We have been inundated after planting 4 of them. And I keep forgetting to check and they grow overnight into metre long marrows! I have continued to plant around the farm extensively from late autumn into the start of spring. Each year I sprout 100 or so acorns which we collect from a variety of places during autumn. The following year I can plant well established seedlings as well as a variety of plants for our hedgerows, woodlands and windbreaks. Our aim is to reforest all of the property except the vineyard and, even there, we have interplanted an orchard and left places to grow insect attracting plants and herbs, in an attempt to increase the biodiversity. As a consequence we have a healthy population of spiders, frogs, insects and, best of all, birds. When we first came here 25 years ago, and it was just grass, there were few birds. Now they are everywhere and in all shapes and sizes. Wedge-tailed eagles. Yellow-tailed black cockatoos. Maggies and Kookaburras. Wrens,fantails,robins and swallows. They come here to nest and raise a family. This year, just outside the kitchen door, we watched as a brood of swallows launched themselves, starting with a tentative flight onto the picnic chairs, then the short flit around the garden until they could finally perch above the house on the power line, all in a row, and take their turn showing their mastery of the air and acrobatic skills. I have a large tiled plate sitting on the outside table that I keep full of water so that it can be used by the many birds in the garden to bathe and drink from. It is in constant use. So; nets off the chardonnay tomorrow and picking at 7am the following day. I'm always pleased when we get to this time of the year. 12 months of work goes into this moment and it is good to get going and see what the vines have produced. Every year is different, and there are always surprises, both good and bad. Definitely not boring and different vines = different wines. This year we will pick the young cabernets; merlot, malbec, cab franc and petit verdot. Could be a disaster but we are very curious to see what they can come up with. We will have lots of fun sampling. Jonathan has just bottled the 2016 Chardonnay and it is lovely and fresh with a hint of tropical fruits and soft tannins. Of course we have to sample over dinner! We have an extra special event as well this season. Kat and Thom are expecting and the baby is due in 9 days. We will keep you posted! We have begun vintage for this year with the picking of the chardonnay last Thursday, a week later than last year’s pick, but still early when we consider that 10 years ago we weren’t picking until March or April. This year we have had a tricky season with intense heat through December when the vines were still soft and growing, consistent heat over January and then very little rain. All of this following on from a very dry Spring that left us with half full dams and a limited capacity to irrigate all the vines. February has brought a little relief in that it has been relatively cool and we had some very welcome rain a few weeks ago. Thursday was delightfully cool and overcast, a perfect start to what can be a very long day. Pickers arrived before 7am and we were out on the tractor fetching buckets half an hour later. The fruit was still cool from the low over night temperature which is a good thing. The white wine grapes are crushed as soon as practical after being picked and, unlike the red wine grapes, are usually pressed straight away rather then leaving them to rest on their skins for a period. We have a basket press for this which is the slow stage of the whole process and necessitates a certain amount of manual labour. We had finished picking by 2pm but were still in the winery at 10pm doing the last of the pressing. As I said, it’s a long day! At least we were better organized than last year when the boys finished at 5am the next day. This season we have spent considerable time in the vineyard through December and January dropping fruit and paying attention to cropping levels. This works out well in the pinot as we can use the unripe fruit to make Verjus, a staple in our kitchen and an extra product that we can offer for sale. This year we have made 400 litres, the first for 3 years and it looks as though it will be of good quality again. In the end we picked about 3.5 tonnes of chardonnay and have 2,000 litres of juice from that. It refined but full of flavour: we will see what fermentation brings. In the meanwhile we are getting ready for the next pick: pinot and shiraz together next Friday. Jonathan estimates that we will have 10 tonnes for the day. There are times that I watch the picking machine in the neighbouring vineyard enviously, but it seems such a brutal process that I can’t see how it would be the best thing for the grapes or vines. So, we have a lot of work to do. Luckily Ed is still around and penniless so we can make use of his energy and strength as well as his engineering brain when things start to unravel, which they always do at some point! Despite the lack of rain, the vines have done well this year. This is the first year that we haven’t used any herbicides of any sort and we have found that the under vine mower is working well as a substitute. Mulching all over the farm is becoming essential: under the vines, in the orchard and vegetables, the paddocks and the garden. We use mostly old, spoilt hay but anything will do: garden clippings, sugar cane mulch, and chipped branches from the power company prunings. The mulch protects the soil from the sun, limits water loss via evaporation and eventually breaks down and adds humus and bugs to the soil. We can cut hay here and do so when we need it. The last of the bales have been spread this week so I will plan to make more this summer. Australian soils are old and often very fragile. I find that our soil does best if it has lots of organic matter and isn’t worked too much nor exposed to our harsh summer sun. The Yarra Valley has dry summers when the soils can set like concrete and then wet winters when everything is either under water or a bog. This is a challenge. I have established both an orchard and a new vegetable garden in the vineyard area over the last couple of years to hopefully bring some biodiversity into the site and, so far, they are doing well. We are enjoying eating our produce: there is nothing quite like anything just picked, and the blackberries have been amazing, so there is plenty of jam in the pantry. We haven't eaten any of the sheep. I'd rather them as lawnmowers than chops. We will report back after the end of vintage. Hello everyone, I finally can put pen to paper, figuratively at least, after a considerable lapse. The 2015 vintage has come and gone and is proving to be a very interesting one. The lead up to it was pretty well perfect: dry, warm and long. Autumn seemed to be endless. We picked late and have big wines as a result. Big pinot and big cabernet in particular. Geof and Jonathan continue to be the A team and spent endless evenings in the winery nursing their "babies" along. Vintage is the time for the long lunch under the trees with family and friends. We are in our 4th year of biodynamics transition and the vines remain healthy and are producing fruit with good and complex flavours.We are enjoying the process as well: less spraying, and the pleasure of the biodiversity that this system brings with it. The sheep have spent all winter in the vines and are fabulous lawnmowers. The horses joined them in the pinot and chardonnay for some months until they decided to begin the pre-pruning process early for us, necessitating their immediate removal! Winter has been cold and relatively dry until a few weeks ago. Recent rain, and particularly the continuing drizzle, has the creek flowing briskly and the ground very wet under foot. No vehicles in the vines except for the quad bike. The Yarra Valley has most of its rain in spring so we are hopeful of enough in the next few months to fill the dams which are still lower th we would like. Frosts have been numerous this year which doesn't matter to those things that are dormant but presents a bit of a challenge to those less resilient. The lemon scented gums, native to Queensland, are quite sensitive but seem to be able to make a good comeback, given time. Jonathan has been busy with a new project, playing builder. Guided by cousin Tom and aided from time to time by Ed (son), he has created a barrel room in which we can keep barrels of wine warm enough so they can complete their fermentations. With night time temperatures well below the desired temperature of 12c, a smaller space that can be heated above ambient temperature is essential. We have also built a new machinery shed, freeing up space in the winery area and, due to the quirky construction using shipping containers, providing a much needed storage space for the children's stuff that still doesn't seem to have a home! I have been very busy planting trees and shrubs again this winter, starting as soon as the autumn break arrived. I have added to the plantings within the vineyard, aimed at attracting beneficial insects and small birds. The hedgerows have also been plumped out and we have created a small terrace on the contour in the front paddock, in order to have more protection from the wind and further wildlife habitat. I adore wattles so they feature a lot in all of the plantings. They are quick growing, beautiful and are nitrogen fixers so are great for the soil and other plants as companions. Jonathan has been busy locally attending wine shows and wine events: dinners etc. Our recent review from James Halliday, giving 96 points to the 2012 Le Batard pinot blend and 95 for the 2011 chardonnay, has been very pleasing. We have had to add delivery boy to Jonathan's list of accomplishments! Now we are seeing the first signs of spring. Daffodils under the trees and the first cherry blossom add a heady scent to the still cold air. We are off to warmer climes in the northern hemisphere over the next months, exploring Burgundy and the Languedoc regions of France and, of course, doing plenty of research into wine making: for work reasons of course!! Finally, another blog from all of us at Tarrahill now that my computer is talking to me again. What a busy year in 2014: selling the family home, moving to the farm, a bit of travelling and plenty of work in the winery and vineyard. The wines are developing well and we are very pleased to have very good recent reviews of them, including the 2011 chardonnay. ( more in a post from Jonathan soon). January has been delightfully cool which has made the vineyard work very pleasant. Radio national is wonderful and makes the hours fly. Last week I even thought that we were in autumn already. However, the next few weeks of hot dry weather may change my mind! The young vines have grown well this year and have produced a little fruit which we are interested to sample. We will mulch under them with the spent hay rounds to help increase organic matter in the root zones. It is netting time again, probably my least favourite job. We never seem to remember how to do it from one year to the next and it always takes twice as long as you think. We have nearly full veraison ( when the grapes start to colour and ripen) and the 3 main reds are all developing at a similar rate which is a little unusual: normally the cabernet would lag well behind the pinot and shiraz. The pinot is developing well and showing its medium, tight bunches. The shiraz has bigger but more open bunches. The cabernet is somewhere in between. Due to the prolonged dry spell we have been watering, particularly the young vines, but with the hot weather approaching, the whole vineyard is getting something. This drops the dam levels down considerably so we will hope for a good autumn break. We have seen some changes around the winery over the summer and now have a new machinery shed made from two shipping containers spanned by a large polytunnel, magically put together by our obliging neighbors. I love it because I can now put all the kids stuff into a container and forget about it! The sheep, our little lawnmowers, are confined to the paddocks until after vintage. The gumnuts in the spotted gums bring flocks of noisy but characterful gang-gang cockatoos. We have lots of additional farm produce this year. Wild blackberries that make a wonderful breakfast snack, fruits in the orchard including my first Gravenstein apples, and the very wild but otherwise fruitful veggie gardens. So, here we are at the start, or end, of another vintage. Picking will only be weeks away now that the heat has arrived. Enjoy the rest of the summer and we will look forward to sharing the fruits of our labours with you all later in the year. Spring has finally arrived and brought with it the usual chaotic weather conditions. 25 degrees one day: hail and thunderstorms the next. The plus about the windy and warmer weather is that there has been no further frosts. The frost affected vines are recovering well and we are seeing strong shoots from the bases of the spurs that will take over next year without major changes to the established structure of the cordon. This is positive. Hail continues to be a lurking threat. When the sky darkens and the temperature drops and we hear the tinkling patter of ice on the tin roof, we hold our breath and pray that it is brief and fine. No golf balls please!! Some years ago a number of vineyards in the valley were completely defoliated by hail. The young vines are growing well but need daily attention so that they can make the most of the warmer temperatures. Unfortunately, the snails have discovered the new shoots in their protective guards, so we have had to declare war on these pesky mollusks. What a pity we can't eat them! A little garlic and some French butter......! We have the 2011 chardonnay in the winery now and have been tasting the different barrels. The question is always: to blend, or not to blend. Good fun. Hello to everyone once again. Vintage is over for another year and some may say 'thank goodness for that! '.A blisteringly hot summer followed by a prolonged dry period and then a drawn out autumn. The grapes ripened early and then didn't seem to be able to hang in there to slowly complete the process and fully develop flavours. The acid levels began to fall in March so we decided to pick relatively early with the flavours fresh but the sugars lower and thus lower alcohol levels in the resulting wines. Yields were well down throughout the Valley: probably by 50% for us: many growers were looking at even lower yields, if they picked at all. Bird damage is a perennial problem, though our main problem is home grown in that our geese have a real taste for ripe grapes and have a cheeky knack of getting under the nets. The picking days are long with pre-dawn starts and post-dinner finishes. Geof is indispensable at the best of times but particularly at vintage and we are also very pleased to now have Michael, our new assistant in the vineyard and winery, to lend a hand. The Pinot was very low in tonnage as we had picked much of it at veraison so we could make enough Verjus for the year. The shiraz coped well with the heat and cropped at about one tonne per acre. The Cabernet was much the same and, running true to form, produced some good fruit. Jonathan has been kept busy with initial fermentations and then the malolactic fermentations as required. It is nice to finally have everything bedded down for the winter and then be able to get on with the other jobs that are always lurking in the wings, needing attention. Autumn is the time for clearing up the vineyard and we are hopeful that our lambs will help in that: they are getting bigger all the time. Jonathan and Michael have been very busy tidying the winery and reorganising the spaces to better accommodate the new equipment that continues to arrive! Autumn is also the time for putting out the special biodynamic sprays that help the development of the soil and encourage better plant growth. We have our own stirring equipment now and have adapted the ATV so we can use it to spray the whole place, garden and vegetables included. The long autumn continues and we still have uncommonly warm weather. It will be interesting to see what effects these have on the vines in the coming growing season. Welcome back after what I hope was an enjoyable holiday break for everyone. What a hot spell we had in January! Our guests from the UK got a good taste of an Aussie summer this time but it created problems for the vineyard and the farm in general. The potential for fire is never far from our minds at this time and we had our fire plan ready from the first heat wave. The garden is very dry ,though the deciduous trees around the house seem to be doing well. We water only pots and vegetables usually but I have put some water onto the lawn immediately in front of the house in the hope that it would slow a grass fire and buy us some extra time. Even the indestructible agapanthus haven't enjoyed the intensity of the late afternoon sun. The vineyard has dried out considerably and the heat has hastened veraison, the time when the grapes begin to colour and the bunches to fill out. These pinot bunches are part the way through veraison. Similarly the cabernet, though not as advanced. All the varieties develop in their own time.! Evidence of some of the problems in the vineyard this season remain visible. A hail storm in late November caused vine, leaf and berry damage. Sunburn on the west-facing leaves of the chardonnay. Any exposed fruit can be similarly burned. The young vines, our hopes for a Bordeaux blend, are doing well with a bit of extra water when it is very hot. Last week the girls and I went to Daylesford for the day and really enjoyed some Medlar jelly as an accompaniment to cold meats, so we are treasuring our baby medlar trees and look forward to their fruits! The meadow seed mix that I broadcast in autumn has resulted in a selection of herbs coming up in the vineyard inter rows which we hope will seed and spread further and continue to attract beneficial insects. Our views have changed from the lush green of spring to the golden yellows of summer. Dried grasses that catch the light and lend a stark contrast to the greens of the vine canopy and the surrounding trees. As the grapes ripen the birds decide that they would like some of the action, so it is time for netting. The nets aren't foolproof but keep most critters out. They have to be checked daily in case birds become trapped inadvertently and need rescuing. Occasionally a snake gets tangled and that presents an interesting challenge! Our new mowers for the vineyard arrived just before Christmas and have settled in well. They are enjoying their new home and the shade of the oaks in the heat of the day. I have tried in vain to make friends which is very vexing. Not even a bucket of oats will tempt them yet: too much grass! So we are rolling rapidly towards vintage 2014. More nets on this evening: the main block chardonnay. Tomorrow we pick part ripe pinot to make verjus the delicious liquid that comes from crushed, unripe grapes and used as an alternative to vinegar, lemon juice or white wine in many dishes and sauces. Every winter we bake quinces in verjus, adding only raw sugar and a vanilla pod. After 6 hours in the oven, the quinces are dark red and have an amazingly intense flavour. A Happy New Year to everyone and stay cool! November has arrived and brings some welcome warmer weather, at least initially! This is good for us and for the vines but no so good for the dogs. The snakes are stirring, so the dogs have to begin their summer confinement in the house garden, allowed out only under close supervision. I cut tracks through the grass that is our lawn so we can see where we are walking in the morning and do the same with the tractor through the paddocks. We used to mow everything but I soon came to realize that we were probably doing more harm than good, particularly to the frog and insect population. The soldier beetles came in their hundreds last week. They are fantastic at devouring the thrip on the roses and any other unwanted pests, so they are very welcome. They hang about best on the long grass, so I leave it for them. Less mowing for me! We have plenty of other welcome visitors to the garden. And the swallows have returned to their old nesting site to raise the family. The vines are growing well, tips reaching to the sky. We raise the trellis wires as they grow so that the shoots are supported and positioned as vertically as possible, hence the name of the trellis type is VSP: vertical shoot positioning. The vines are flowering, beginning with the pinot and chardonnay. I have tried to find out how pollination occurs and it turns out that it is a vexed question and no-one really knows! Really?!! Then the rain came, initially still with warm weather, then gradually cooler until we have been back into lighting the fire at night and rugging up during the day. Much as the water is welcome in house water tanks and on the garden, it brings the risk of fungal diseases in the vineyard. Downy mildew is always a possibility in this sort of weather and we make daily inspections of the vineyard looking for telltale signs. The first sign may be a lighter spot seen on the upper surface of the leaf: an oil spot. Then it may develop further so that the fungus is clearly visible on the under surface as a white mould. A curative systemic spray needs to be put out at this time, even though only a small section of the vineyard is affected. The fungal spores can spread very quickly though the rest of the vineyard given the right conditions. Within the week we see good results. It is disappointing to have to resort to systemic sprays but we are hopeful that this will become unnecessary as we emerge from our transition period into full biodynamic practice. The first of our open weekends was this weekend and we have been busy sorting, tidying, labeling, mowing and generally rushing about. I have decided it is like having a whole lot of friends for dinner as it makes you do all those tidying jobs that you never seem to get around to doing otherwise! The weather was perfect and it was lovely to catch up on news and let people enjoy getting out of town for the day. I love frosty mornings: the days when I have to don endless layers before venturing outside. The dogs love these mornings as well. They seems to be able to follow a scent, despite the freezing conditions. We make tracks wherever we go. Roger loves to run with the grass crackling underfoot. Maggie stays close to me. She is my guardian and always on the lookout for problems ahead! The vines are content on the frosty days, dormant and well insulated against the ice and cold. The wintery weather almost feels cleansing, allowing, or even requiring, a period of quiescence where plants and animals alike gather strength for the busyness of the months to come. BUT, and this is a big but, there is also the Spring frost. Last week, Friday morning to be exact, the temperatures dropped below zero in the early hours of the morning and the valley awoke to frost again. We are about 2 weeks into budburst. The chardonnay first, then the pinot. followed by the shiraz and finally the cabernet. But then comes the first frost, burning the new, tender leaves. The damage is mainly in the southern sections of the chardonnay and pinot. It looks as though the cold air has bounced its way down the vineyard, completely missing some sections and landing with a resounding thump on others. We can only hope that the vines have enough energy to re-shoot and then flower. Meanwhile spring has really sprung and most of the animals and plants don't seem to have noticed the cold snap at all. The geese don't care about the weather it seems. And the oaks relish all weathers putting on a beautiful lime-green display for all to see. still love my frosty mornings, but it is all in the timing!!!!! !